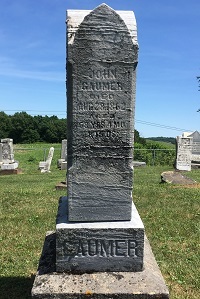 John Gaumer was born on April 13, 1794 or 1799 in Southampton Township, Somerset County, PA, the son of Johann "Jacob" and Maria "Catherine" (Sowash) Gaumer Sr.
His name also has been spelled "Gormer" over the years. Of the name variation, a government official once examined documents and stated that the "papers show conclusively that the differently spelled name means one and the same person." As a young adult, John was of medium height with fair-colored hair and pale blue eyes. When the War of 1812 broke out, John went to Zanesville to enlist in Captain James Brown's Company of the 3rd Regiment of Ohio Militia. The regiment was commanded by Charles Miller. He served a six-month term from Aug. 20, 1812 to Feb. 20, 1813. He received his honorable discharge at the rapids of the Miami River. Whatever drilling, marching or battle engagements he may have experienced are not yet known. 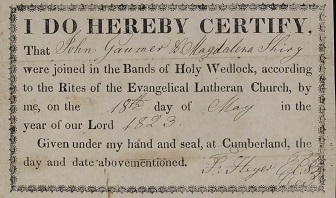 On May 18 or 28, 1823, at the age of 29, John was united in holy matrimony with 20-year-old Mary "Magdalena" Shirer (1803-1887) (sometimes misspelled "Shirey") of Wellersburg, Somerset County, the daughter of farmers Adam and Saloma (Schwartz) Shirer. The ceremony took place in Cumberland, Somerset County, PA, with Rev. F. Heyer officiating under the tenets of the Lutheran Church. Mary may also have gone by "Polly" -- a common nickname -- and in one census record she was mis-named as "Nancy." Their eight known children were Chester Thompson Gaumer, Saloma Zimmer, Susanna Gaumer, John Adam Gaumer, Hannah Gaumer, Mary "Polly" Herbert, Jacob Riley Gaumer and Elizabeth Gaumer. Sometime before 1829, husband, wife and young children left Somerset County and moved to Ohio, following a pattern of migration of Gaumers to Adamsville, Muskingum County. Later, in about 1839, when their son John Adam was young, they relocated again, settling in Linton Mills, Linton Township, Coshocton County. In 1850, under the terms of the Act of Sept. 28, 1850, John received title to 80 acres of government-owned bounty land in Ohio. He sold the property within a few years. Federal census records for 1850 show the couple residing on a farm in Coshocton County, with the census-taker spelling their name "Gamer." They remained there throughout the decade of the 1850s, and in 1860 the census-compiler spelled the name "Gommer." They are named in the book Portrait and Biographical Record of Guernsey County, Ohio. 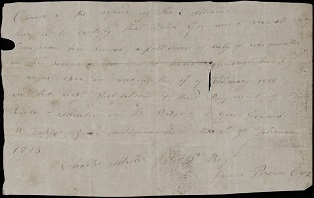 The entry, about their son in law Peter Herbert, states that Magdalena and John "were widely known in Coshocton County, where the remaining years of their life were passed, and by means of their sterling worth and strict integrity won the confidence and high regard of all whom they were brought in contact." Magdalena survived her husband by a quarter of a century. She watched with anxiety as her son John Adam Gaumer went away to serve in the Union Army during the Civil War as a member of the 191st Ohio Infantry. Details are below. Magdalena's mark with an "X"
When the U.S. Census count was taken in 1870, the 66-year-old widow made her home with 24-year-old married son Riley Gaumer and his family. While living in Linton Mills, Coshocton County, she applied for and began receiving a federal military pension for her late husband's service. Providing testimony in support of her claim, having known her for four decades, were Isaac L. and Thomas L. Hammersley. As of Feb. 17, 1879, when the certificate was issued, she began receiving $8 every month. The amount was raised to $12 which she received up until her death. Son Chester Thompson Gaumer (1830-1905) was born in about 1830 in Ohio. He was a longtime farmer in Linton, Coshocton County. Chester was united in marriage with Mary "Jane" Ransopher (1833-1887) of Linton. They had six known children and possibly more: John Riley Gaumer, Andrew J. Gaumer, Mary Ann Adams, Julia Gaumer, Aaron Gaumer and C.T. Gaumer.. In 1860, they dwelled on a farm in Linton, as shown in the census, next door to Chester's aging parents. He is named in the 1895 book Portrait and Biographical Record of Guernsey County, Ohio, which states that he was "a retired farmer of this township, and at present living in Guernsey [County." Q. Please state where you voted at the last October election, and for whom you voted for Congress. A. I voted in Linton township, and for George W. Morgan. Q. Were you ever drafted into the military service of the United States; and if so, when was it? A. Yes; I was drafted. It was the fall draft, two years ago last fall; in 1864. Q. Did you report for service under the draft? A. No, sir: I didn't. Q. Where were you at the time of the draft? A. I was in Wheeling township, Guernsey county, Ohio. I was there one summer season. Q. When did you go to Wheeling township, and for what purpose? A. I went there in April, 1864, to farm. A. I staid there until in the fall; some time in October. Q. When you left there where did you go? A. I moved to Indiana. Q. How long did you stay in Indiana? A. I staid there about nine or ten months, and then moved back into this township again. Jane passed away on Nov. 7, 1887. Chester joined her in eternity at the age of 75 on April 11, 1905. Son John Riley Gaumer (1853-1952) was born on Aug. 11, 1853 in Ohio. In about 1874, when he was 21 years old, he married 18-year-old Sarah Phillips (1856-1891). Among their children were Wilbur B. Gaumer, Laura A. Gaumer, (?) Gaumer and Chester Thomas Gaumer. They dwelled in Linton Township, Coshocton County. In 1885, after 11 years of marriage, the couple migrated to Kansas and set down roots in the town of Kirwin, Phillips County. They owned a tract in Bow Creek Township in the west half of the northwest quadrant of section 36, township 5, range 17, totaling 8.25 acres. There, he was a member of the Odd Fellows lodge for 54 years. Sadly, Sarah died in 1891 at the age of 35. Her widower survived for another 60-plus years. Circa 1910, he was employed as a retail merchant in Kirwin and boarded in the household of Edgar W. and Sarah A. Warner. In August 1904, he and his son Chester left Kirwin for Stuttgart, KS, where he was hired to manage the town's grain elevator. In 1915, living in Texas, he brought 4,000 bushels of wheat back to Kirwin to sell with the help of his brother Aaron. Then in 1919, he was employed as a branch store manager for Gray-Stagg at Claudell, KS. By the early 1950s, he had moved again to Denver, CO. John passed into eternity in Denver on Feb. 24, 1952 at the age of 98. In an obituary, the Salina (KS) Journal said that he was a "Phillips County pioneer" and had "lived in Kirwin most of his life." His remains were transported back to Kirwin for funeral services held in the Kirwin Methodist Church. Grandson Wilbur B. Gaumer (1876- ? ) was born in about 1876. Circa 1901, he is believed to have attended college in Holton, KS. In reporting on his higher education, the Phillipsburg (KS) Dispatch said that "Phillips county probably has more pupils at the Horton school than any other school in the state. They are more than pleased with it too." Thenin January 1903, he appears to have been named editor and proprietor of the Phillips County Post, published every Thursday. The Lebanon (KS) Journal reported that "The first issues look prospereous and up to date. Mr. Gaumer is a scholar, a gentleman and a hustler, three essentials in the business, and with the whole territory of Phillips before him in the field of politics for the people, will more than likely build up a good paper." When he was about 27 years of age, on April 19, 1903, he was united in matrimony with Esther Hillmon ( ? - ? ) at her parents' home in Lyndon, KS. Wilbur reported on his own marriage in the Post, saying "The bride is the daughter of highly respected and prominent citizens of the community in which they live. She is a young lady of fine and pleasing appearance and will no doubt prove a worthy companion for her husband. We are unable to say anything favorable to Mr Gaumer, reports to the contrary notwithstanding, but hope Mrs. Gaumer has made no mistake in her choise." Wilbur also became a partner in the real estate and insurance firm of Gaumer, Boyd & Eberstein which primarily brokered the sale of farms in Phillips County, western Kansas and Colorado. The firm eventually purchased the assets of the Post and retained him as editor. The Post was not profitable, and by February 1905 he was named deputy sheriff of Phillips County. He may have bought out his realty business partners and took full control, renaming it circa 1906 as W.B. Gaumer Realty Company. He often published notices of available property in the Phillipsburg News and County Post. By 1909, the firm appears to have been known as Gaumer & Mills. Granddaughter Laura A. Gaumer (1878- ? ) was born in about 1878. Granddaughter (?) Gaumer (1880- ? ) was born in April 1880 in Linton Township, Coshocton County. Grandson Chester Thomas Gaumer (1883- ? ) was born the day after Christmas 1883 in Linton Township, Coshocton County. He spent the summer of 1903 in Minnesota with the expectation that he would return to Campbell College in Holton, KS to complete his studies in stenography. By 1905, back in kansas, he worked in the clothing department of the Hull & Co. store in or near Phillipsburg. On Oct. 7, 1908, he married Kansas native Anna Eudura Franz (1885- ? ). They initially made their home circa 1910 in Goodland, Sherman County, KS, where he was employed as a fireman on the railroad. Later, they resided in Topeka, KS, where Chester worked as a contractor and farmer. The couple produced one known son, John Franz Gaumer. Chester was a member of the Odd Fellows lodge. In October 1952, Chester filed an application to join the Sons of the American Revolution based upon Jacob Gaumer Sr.'s service. In his paperwork, he cited that Willard Floyd Gaumer already had been accepted into SAR membership and that Janice Gaumer Stone was a member of the Daughters of the American Revolution. Circa 1952, their son John resided at 1606 Althea Drive in Houston, TX and had two young children, Grant Chester Gaumer and Jane Annette Gaumer. Granddaughter Alta Gaumer (1889- ? ) was born in about 1889 in Kansas. She played basketball for her school but dropped out in November 1903. In 1910, census records show her and her widowed father boarding in the household of Edgar W. and Sarah A. Werner in Kirwin, Phillips County, KS. Son Andrew J. Gaumer (1855- ? ) was born in about 1855 in Ohio. At the age of 25, in 1880, he dwelled in the farm household of his married brother John Riley Gaumer in Linton Township, Coshocton County, and provided farm labor. The federal census-taker in 1880 recorded that Andrew was out of work four months during the year. Daughter Mary Ann Gaumer (1857- ? ) was born on Sept. 5, 1857 in Ohio. She married C.P. Adams ( ? - ? ). They dwelled in Adamsville, Muskingum County. Suffering from stomach cancer, Mary Ann died at age 68 on Nov. 3, 1925. Burial was in New Hope Cemetery in Muskingum County. Paul B. Adams of Adamsville signed her official Ohio death certificate. Daughter Julia Gaumer (1860- ? ) was born in about 1860 in Ohio. At the age of 17, on June 21, 1877, she was united in holy matrimony with John Sharrock ( ? - ? ). The nuptials took place in Coshocton County by the hand of John Philips. Son Aaron Gaumer (1866-1963 ) was born on Nov. 4, 1866 in Linton Mills, OH. As a youth, he memorized the famed poem Thanatopsis by William Cullen Bryant and was able to quote it for the balance of his life. On April 23, 1896, when he was age 29, he married Mary Ellen Dawson (1873-1953) in Dover, Muskingum County. Their only known daughter was Alta Stuckman.In 1905, they left their residence in Dover, OH and relocated to Kansas to join his father and siblings in Phillips County. Said a newspaper, "At first he farmed with the Gray-Stagg families, later he helped operate a drug store and other business concerns in Krwin. Still later he operated his own farm northwest of Kirwin. He was very capable and dependable in his work." The Gaumers resided in 1911 in Deer Creek, Phillips County. He and his friends John M. Gray and Nate Garrison are known to have traveled to Palacias, Texas on business in the winter of 1910. He also sold cattle stock and in June 1915 disposed of a herd of Whiteface yearling steers for $45 per head. In September 1915, after visiting Mary's relatives, one accompanied the family home to assist in cooking during threshing season. He and a brother jointly operated a mercantile business in 1920 in addition to farming, and in October 1920 he ran for election for county treasurer. The Gaumers are known to have attended a reunion of the Ransopher-Gaumer families in June 1929 held in Gage Park in Topeka. The Manhattan (KS) Republic reported that "A basket dinner was served and following the dinner photos were taken. A family tree is being arranged by one of the family, which will prove to be an interesting account of the families." Among the other attendees were Aaron's daughter Alta and family, brother John Gaumer, Rev. and Mrs. O.B. Ransopher and daughter Helen Lee, Garland Hughes, Mrs. E.W. Logston, Mr. and Mrs. J.M. Harrison, Mabel Ransopher, Mr. and Mrs. Morris Gray, Mr. and Mrs. Floyd Coder, Mary Ransopher, Everett Ransopher, Mrs. A.M. McHenry, Mr. and Mrs. Will Spiker and children, Mr. and Mrs. Robert Ransopher, Mr. and Mrs. Willis Ransopher, Louise Harrison, and Mr. and Mrs. Earl Barney of Topeka. The couple grieved when their only grandson, Edsel Stuckman, was killed during World War II. Aaron and Mary celebrated their 50th wedding anniversary in May 1946. Mary Ellen died on April 26, 1953, ending their marriage of 57 years. Aaron survived by another decade. Toward the end he went to live in a local rest home in Phillipsburg. He passed away at the age of 96 in Phillipsburg on Sept. 3, 1963. Burial was beside his wife in Kirwin Cemetery. Granddaughter Alta Gaumer (1898-1992) was born on New Year's Day 1898 in Dover, OH. As a young girl she moved to Kansas with her parents. On March 19, 1923, she was joined in marriage with Hugh W. Stuckman ( ? -1976). Rev. Read officiated at their nuptials. The couple bore one son, Edsel Stuckman. The family resided in Phillipsburg, Phillips County, KS and were members of Kirwin United Methodist Church. Tragedy shook the family during World War II when their only son was killed in France on Jan. 19, 1945. Some 19 years after his death, in July 1964, the parents traveled to Europe to visit his grave, with the news covered in the gossip columns of the Phillips County Review. Hugh passed away in 1976. Alta survived as a widow for 16 years. Toward the end, she became a resident of Phillips County Retirement Center. She died there at the age of 94 on Nov. 29, 1992. An obituary was printed in the Salina (KS) Journal, which noted that "There are no survivors." Rev. Harold Ellis preached the funeral sermon at Olliff-Boeve Memorial Chapel, followed by burial in Kirwin Cemetery. Great-grandson Edsel Stuckman (1925-1945) was born on May 19, 1925 in or around Phillipsburg. He was a talented singer and performed as a 10-year-old in Kansas City, with his performances viewed by the conductor of the Kansas City Philharmonic Orchestra and music director of the Kansas City Schools. His music also was broadcast on Kansas City radio station WDAF-AM. During World War II, he jonied the U.S. Armed Forces and trained at Lincoln, NE, Shreveport, LA and Camp Phillips, KS. He was assigned to a medical unit and was deployed to the European Theater. He made a name for himself as the driver of a Jeep which was the first vehicle to enter four separate towns recaptured from the Germans. Reported the Phillips County Review, "On all four occasions ... he drove the vehicle in while heavy fighting was still raging for the towns in order to evacuate wounded soldiers to battalion aid stations in the rear. On one trip his jeep was hit by German machine gun fire but he escaped injury and succeeded in evacuating the wounded soldiers." Tragically, he was killed at the age of 19 in France on Jan. 9, 1945. His remains were placed at rest in Epinal American Cemetery and Memorial in Vosges in the Lorraine Region of France. As well, a memorial stone was placed in his memory in Kirwin Cemetery in Phillips County. Son C.T. Gaumer ( ? - ? ) lived in Woodruff, KS in 1906 and was very ill in April that year. Daughter Mary "Polly" Gaumer (1840- ? ) was born on April 27, 1840 in Coshocton County. At the age of 16, in 1856, she was united in marriage with 22-year-old German immigrant Peter Herbert (1834- ? ), son of Congrad and Margaret A. Herbert. They settled on a farm of 137 acres in Wheeling Township, Guernsey County, OH. Peter came to America at the age of three, arriving after "a tedious journey of ten weeks" in the port of Baltimore, and then traveling on to Zanesville. He is profiled in the book Portrait and Biographical Record of Guernsey County, Ohio. The entry says of Mary that "She is a most estimable lady" and that she was a "pleasant and entertaining wife [who] are members of the best circles of society in the county." The text says of Peter that he was "an excellent example of sturdy enterprise, thrifty habits and persistent industry, characteristic of so many of our farmers, may be found in the life of Mr. Herbert, who is one of the wealthy residents of Wheeling Township...."
Their children were Chester Herbert, Mary A. Herbert, Martha J. Herbert, Saloma J. Herbert, Laura B. Herbert, William Herbert, Eliza A. Herbert, Jacob R. Herbert, Maggie Ailer and Charles H. Herbert. Over the years, Peter served for more than 15 years as treasurer of Wheeling Township and for two decades as a member of the school board. He also was a member of the Methodist Episcopal Church, serving as trustee and steward for 20 years. Son William Herbert is named in the 1895 book Portrait and Biographical Record of Guernsey County, Ohio, which says that he was "engaged in farming in Wheeling Township, this county." 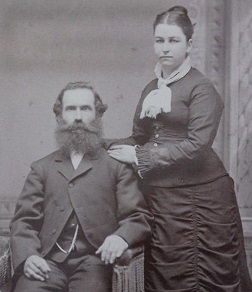 Son Jacob R. Herbert is named in the 1895 book Portrait and Biographical Record of Guernsey County, Ohio, which says that he "is a well-to-do agriculturalist of Tuscarawas County." Daughter Maggie Herbert married William Ailer. 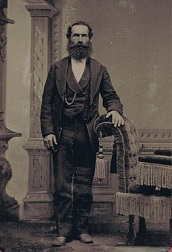 They are named in the 1895 book Portrait and Biographical Record of Guernsey County, Ohio, which says that William was "a farmer of Muskingum County." Daughter Eliza A. Herbert was unmarried and living at home in 1895 when she was named in the book Portrait and Biographical Record of Guernsey County. Son Charles H. Herbert was unmarried and living at home in 1895 when named in the book Portrait and Biographical Record of Guernsey County. Son Jacob "Riley" Gaumer (1846- ? ) was born in about 1846 in Coshocton County and grew up in Linton Township. On Oct. 1, 1865, when he was age 19, Riley married Mary E. Baker (1848- ? ), also of Linton Township. Local justice of the peace John S. Williams officiated, and the news was printed in the Coshocton Tribune. Her maiden name also has been given as "Zimmer." Riley was a stone mason in and around Linton, Coshocton County, OH. Their known children were Ada May Hosick, Sarah H. Gaumer, Edward C. Gaumer, Charles M. Gaumer and Frances L. Gaumer. When the 1870 federal census was taken, Riley and Mary dwelled in Linton, and provided a home for his 66-year-old widowed mother and for nine-year-old John W. Gaumer. By 1880, remaining in Linton, their family had expanded to five children, with Riley's mother continuing to live under their roof. In the late 1870s, Riley's first cousin Lebanon Gaumer and wife Nancy moved to an adjacent farm. Riley occasionally visited the childless, hermit-like couple and at one point had to call in township authorities to administer medical care. For that he earned Nancy's enmity. He later provided testimony in written affidavits in support of Nancy's efforts to obtain her late husband's Civil War pension. Riley is named in the 1895 book Portrait and Biographical Record of Guernsey County, Ohio. The entry states that he was "also living retired in Plainfield, this state." His final fate is not yet known. Daughter Ada May Gaumer (1867- ? ) was born on Feb. 21, 1867 in Coshocton County. She married John H. Hosick ( ? - ? ). They spent their lives in Coshocton. 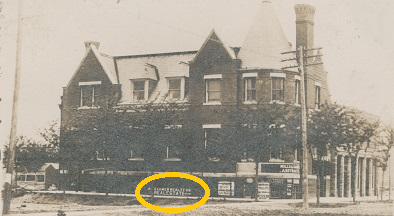 In 1946, Ada May's residence was 355 McClain Avenue in the town of Coshocton. At the age of 79, having suffered a heart attack, she died on Aug. 21, 1946. Burial was in Plainfield, OH. Daughter Sarah H. Gaumer (1869- ? ) was born in about 1869 in Coshocton County. Son Edward C. Gaumer (1871- ? ) was born in about 1871 in Coshocton County. Son Charles "Melvin" Gaumer (1873- ? ) was born on May 5, 1873 (or 1875) in Salem Township, Muskingum County. He learned the trade of carpentry and worked in Coshocton County. On Nov. 22, 1899, at age 24, he was united in marriage with 21-year-old Lenora Martter, daughter of Frank and Elizabeth (Hammer) Martter of Coshocton County. Rev. Walter Ross solemnized their vows. At the time of marriage, she was employed as a cigar roller. Daughter Frances L. Gaumer (1878- ? ) was born in about 1878 in Coshocton County. Son John A. Gaumer (1835-1929) was born on April 30, 1835 in Adamsville, Muskingum County. He was a soldier of the Civil War, produced 17 children with three women and a pioneer settler of Iowa. He stood 5 feet, 4¼ inches tall, with a dark complexion, grey eyes and dark hair. A farmer, he also learned the trade of stone cutting. As a young man aged 21, John Adam and 19-year-old Hannah Ransopher (1837-1914) produced a child out of wedlock, named James Ozro Gaumer. The baby was born in Guernsey County, OH. Just 10 days after the baby's birth, on Jan. 24, 1857, in Coshocton County, OH, John was united in marriage with Elizabeth Fuller (1836-1878). She was the daughter of Isaac and Elizabeth (Devour) Fuller and a native of Coshocton County. 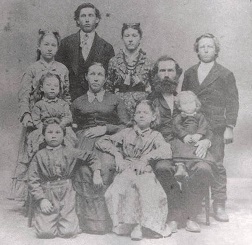 The couple produced these nine children: William Riley Gaumer, Mary Magdaline Royce, Benjamin Franklin Gaumer, Nancy Jane "Jennie" Shaw, Sarah Elizabeth Ryan, Valentine F. Gaumer, an infant son who died age 1 month, Harriet Edna "Hattie" Sanders and Jesse Hannah Ries. During the Civil War, John Adam and Elizabeth had several young mouths to feed in their growing household in Linton Mills, Coshocton County. He waited for nearly four years before making the decision to enlist in the Union Army at the age of 29. He traveled to Newark, OH to join the 191st Ohio Infantry, Company D and was mustered in on March 8, 1865, in Columbus, OH, commanded by Col. Robert L. Kimberly. John Adam rose to the rank of corporal. 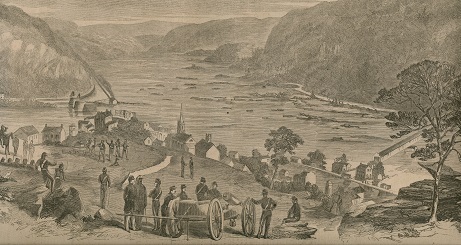 The regiment was part of the 2nd Brigade, 2nd Division of the Army of the Shenandoah. It spent its few months of active service providing garrison duty in and around Harper's Ferry, WV and Winchester, VA. After the Confederate surrender, he mustered out at Winchester, VA on Aug. 27, 1865. After the war, "in 1866 he came to Iowa with his family and settled on a farm six miles southwest of Murray, now known as the old Gaumer home," reported the Osceola Sentinel Tribune. "Here he lived until 1917 when he moved to Murray where he has since resided." Sadly, ending a marital union which had spanned 21 years, Elizabeth passed away at home near Murray on May 13, 1878. Interment was in Hopeville Cemetery in Hopeville, Clarke County. After one-and-a-half years as a widower, the 44-year-old John Adam married again on New Year's Day 1880 to 32-year-old Sarah Eliza Cone (1847-1917). She was a native of Monroe County, IA and the daughter of Ezra Parker and Mary Jane (Jones) Cone. The ceremony took place in Murray, Troy Township, Clarke County by the hand of Rev. Andrew Hancox. She was a dozen years younger than her spouse. The couple went on to produce seven more children of their own -- Clara "Lois" Gaumer, Lora Belle Colwell, John Earl Gaumer, Ernest Fletcher Gaumer, Chester Wipple Gaumer, Lela Viola Morris and Claire Lester Gaumer. Active in the community, John Adam belonged to the Masons for 72 years, first in Plainfield, OH and later in Hopeville, IA, the latter of which he was Master for 17 years, and the Royal Arch Chapter of Osceola. "His early religious training was in the Lutheran church," said the Sentinel Tribune, "but since early in 1880 he has been a member of the Murray M. E. church where he was a faithful attendant until his hearing failed." He is named in the 1895 book Portrait and Biographical Record of Guernsey County, Ohio. The entry states that he was "engaged in business in Iowa." Sadly, John Adam became a widower a second time when Eliza succumbed on May 11, 1917. John Adam survived his second bride by a dozen years. During that time, the monthly pension payment amount was raised to $72. Toward the end, he became feeble and deaf and was unable to walk about the house other than in the daytime. His daughter Lois provided almost full-time care. Other friends stepped forward to provide affidavits of support in the hope the federal government would agree to pay for an in-home aide. Among them were W.B. 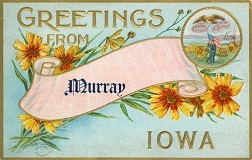 Emory of Osceola, IA and George Lockrie and C.O Freed of Murray. He died in Murray, Clarke County on April 14, 1929. His funeral service was held in the Murray Methodist Episcopal Church, followed by commitment to the earth in the Hopeville Cemetery. Son James Ozro Gaumer (1857-1948) was born on Jan. 14, 1857 in Guernsey County, OH, the son of parents who were not married to each other. He married Mary E. (? ), in 1862, a native of West Virginia. He died in 1948 in Muncie, Delaware County, IN. Son William Riley Gaumer (1857-1887) was born on Sept. 13, 1857 in Coshocton County. He married Celestia Ellen Thomas ( ? - ? ). Daughter Mary Magdalene Gaumer (1859-1949) was born on May 13, 1859 in Guernsey County. She was wedded to Charles "Homer" Royce ( ? - ? ). Son Benjamin Franklin Gaumer (1861-1945) was born on Jan. 30 1861 in Guernsey County. He was twice married. His first bride was Emma Morgan. His second wife was Laura Belle Smith ( ? - ? ). Benjamin is buried in Hopeville Cemetery. Daughter Sarah Elizabeth Gaumer (1865-1941) was born on Sept. 13, 1865 near Murray, Clarke County, the first of the family to be born in Iowa. On May 22, 1884, at the age of 19, she was joined in matrimony with 20-year-old John Henry Ryan (1864-1913). They made their home near Murray, Clark County, IA and had two known sons, Boyd Eastlack Ryan and Basil Edwin Ryan. Sadly, John Henry died on Oct. 19, 1913 at the age of 49. Sarah lived for nearly three decades as a widow. She passed away Sept. 28, 1941 and is interred in San Antonio, TX. Grandson Boyd Eastlack Ryan (1885- ? ) was born on April 1, 1885 near Murray, Clark County, IA. On Nov. 2, 1907, he was joined in marriage with Ingeberg Wangberg (1885- ? ). They produced one son, Jack Boyd Ryan. Boyd and Ingeberg resided in El Paso, TX, where he earned a living as a merchant. At the age of 66, in 1952, Boyd applied for membership in the Sons of the American Revolution based upon the service of Jacob Gaumer Jr. Their son Jack (1924- ? ) resided at 4707 Banner Street in El Paso with his wife and children Robert Boyd Ryan and Rebecca Ann Ryan. Grandson Basil Edwin Ryan (1891- ? ) was born on May 14, 1891 near Murray, Clarke County, IA. At the age of 28, on June 20, 1919, he married 28-year-old Amy Graves (1891- ? ). They produced two children -- Edwin Fletcher Ryan and Amy Ryan Elliot. The Ryans made their home in El Paso, TX, where Basil was a business executive. In 1952, as did his brother, he applied for membership in the Sons of the American Revolution. Basil and Amy had five grandchildren circa 1952, all living in El Paso. Son Valentine F. Gaumer (1867-1900) was born on July 1, 1867 near Murray, Clarke County, IA. He married Jessie Litsey ( ? - ? ). Daughter Harriet Edna "Hattie" Gaumer (1870-1947) was born on May 15, 1870 near Murray, Clarke County, IA. She was wedded Joseph Z. Sanders ( ? - ? ). Daughter Jessie Hannah Gaumer (1873-193) was born on on Sept. 23, 1873 near Murray, Clarke County, IA. She was united in wedlock with John Nicholas Ries ( ? - ? ). Daughter Clara "Lois" Gaumer (1880-1970) was born on Oct. 28, 1880 near Murray, Clarke County, IA. She never married. Circa October 1921, she wrote this affidavit seeking an increase in her father's Civil War pension: "...I am the housekeeper for my father John A. Gaumer, and that I have been acting in such capacity for the last twelve years. My Father is now past 86 years of age and that by reason of his advanced years, feeble condition and failing eyesight, (being unable to go about only in day light, being unable to dress himself etc.) he cannot be left alone, and I find it necessary to give him my constant attention." She died in 1970. Daughter Lora Belle Gaumer (1882-1966) was born on Feb. 1, 1882 near Murray, Clarke County, IA. She was joined in matrimony with Elmer George Colwell ( ? - ? ) and settled in Saskatchewan, Canada. Son John Earl Gaumer (1883-1867) was born on Sept. 27, 1883 near Murray, Clarke County, IA. He wedded Ecka Jensen ( ? - ? ). Son Ernest Fletcher Gaumer (1886-1979) was born on March 22, 1886 near Murray, Clarke County, IA. He was united in wedlock with Amy M. McClure ( ? - ? ). Son Chester Wipple Gaumer (1887-1982) was born on Nov. 19, 1887 near Murray, Clarke County, IA. He married Katie Mae Wolfe ( ? - ? ). Daughter Lela Viola Gaumer (1889-1961) was born on Nov. 30, 1899 near Murray, Clarke County, IA. She was joined in matrimony with Edward Paul Morriss ( ? - ? ). Son Claire Lester Gaumer (1892-1966) was born on April 4, 1892 near Murray, Clarke County, IA. The youngest of his father's 17 children, he was 35 years younger than hia eldest sibling. He was thrice wedded. His first bride was Hazel Vera Housh ( ? - ? ). His second wife was Maud Worley ( ? - ? ). His third spouse was Grace Derry Yeagle ( ? - ? ). He rests for eternity in Santa Maria, California. Daughter Saloma Gaumer (1824-1920) was born on Oct. 12, 1824 in Northhampton Township, Somerset County. She likely was named for her grandmother Saloma (Swartz) Shirer. She came to Ohio as a young girl and grew up in Muskingum County. In 1843, when she was age 19, Saloma married 25-year-old immigrant Valentine "Val" Zimmer (1818-1906), son of Martin and Mary Eve (Spithaler) Zimmer. Valentine had come to America in 1829 from Alsace, France, the German speaking region along the Rhine River next to Germany. The couple did not reproduce. In 1870, 1880 and 1900, census records show the couple as farmers in Adams Township, Muskingum County. In 1870, 21-year-old farm laborer William Keys lived under their roof. Saloma is named in the 1895 book Portrait and Biographical Record of Guernsey County, Ohio. The entry states simply that she was "the wife of Val Zimmer, who resides in Muskingum County, Ohio." Valentine passed away at the age of 88 on May 14, 1906. His death ended a marriage that had lasted for 63 years. Burial was in New Hope Cemetery near Adamsville, Muskingum County. Salome survived her husband by 18 years and resided in Salem, Muskingum County. She became senile and, at age 95, fell and fractured her neck and femur, going into shock. She passed away on June 9, 1920, with interment beside her husband. Rev. I.R. Ladd of Adamsville was the informant for her Ohio death certificate. Daughter Elizabeth Gaumer ( ? - ? ) died sometime before 1895. 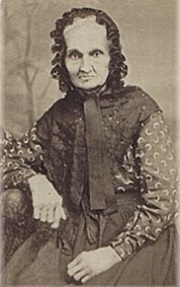 She is named in the 1895 book Portrait and Biographical Record of Guernsey County, Ohio, which simply mentioned that she was "deceased." Daughter Hannah Gaumer ( ? - ? ) died sometime before 1895. Daughter Susan Gaumer ( ? - ? ) died sometime before 1895. John R. Gaumer (1854- ? ) was born in about 1854 in Coshocton County. The identity of his parents is not yet known. On Oct. 14, 1875, in Coshocton County, the 21-year-old John married 27-year-old Mary E. Phillips (1848- ? ). David Trueman performed the ceremony. They may have been second cousins, as suggested by a notation on their marriage license.